We recently received an email from Cory at Pronto concerning some recent success they’ve had using Crazy Egg heatmaps on their website. As always, we love to hear about how Crazy Egg is improving conversion rates for our customers, so we thought this would be a great opportunity to demonstrate how easy it is to grab instant results with our software. For the un-initiated, heatmaps use eye and click-tracking technology to show you exactly how customers are behaving on your web pages. Unlike most types of analytics software, you don’t need any expertise to read a heatmap. What you see is what you get. The “heat signatures” shows you where users are looking and clicking, helping you figure out what visitors want and when you should give it to them. Pronto used this technology from Crazy Egg to increase their number of incoming leads. It’s time to review our newest heatmap case study. Here’s how Pronto did it. Pronto is an all-in-one website service for small and medium businesses. They essentially build a business’ entire web presence from scratch and help run the day-to-day marketing. The conversion goal of their website is to funnel business owners to their sales team in order to establish a long-term working relationship. They want to convert site visitors into active leads. Pronto decided to run a heatmaps test in order to better analyze visitor engagement on their site. Specifically, they wanted to see how these visitors were using the more interactive portions of the site, like videos, drop-downs, and accordions. 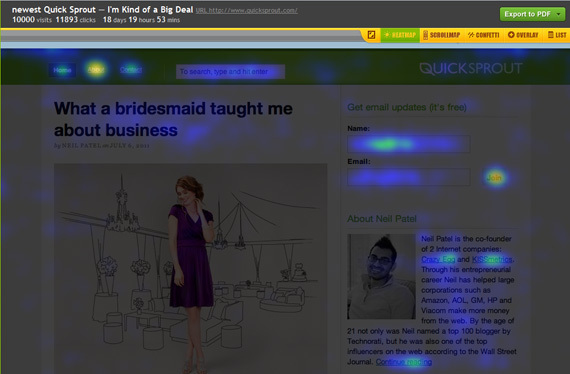 Crazy Egg heatmaps show you where people are viewing and clicking your pages, so you know which elements need optimizing. Notice that people don’t always click where you expect them to. That’s why it’s so important to get heatmap analysis of your page. Once you know where people are clicking, you know what they expect from your page. If a particular element gets clicked a lot, very likely, your visitors expect it to go somewhere. You may need to add a link. Conversely, if a button doesn’t get clicked, it may not attract enough attention or be in the wrong location. You should probably try redesigning it or moving it, so you can get more people clicking where they should be clicking. Now, what did Pronto learn from their heatmap? Let’s take a look. The Heatmap results provided Pronto with three key insights. Visitors were consistently utilizing the interactive educational elements of the site. A significant number of users were contacting Pronto via the tiny “Contact Us” link in the footer. An unexpected number of users were scrolling down and clicking through to industry-specific packages. Insight #1 served to validate Pronto’s investment in educational content for business owners and also let them know that they were acquiring the right traffic. Owners interested in outsourcing their entire online marketing department aren’t going to make that decision likely, and Pronto’s visitors were engaging with the site as the target audience would be expected to. Insight #2 demonstrated that these visitors were liking what they saw and searching for a way to contact the company. You have to be really interested to search out a tiny footer link at the bottom of the page. Pronto guessed that many more users were interested in contacting them directly from the home page but were unable to locate this link. Insight #3 showed Pronto that there was significant interest in their industry-focused packages. Incoming visitors fell within the selected industries, and most importantly, they were intrigued by the idea of a marketing plan tailored specifically to their unique industry’s needs. While Insights #1 and #3 confirmed Pronto’s direction and gave ideas for future expansion, Insight #2 gave them something actionable to pursue immediately. Based on Insight #2, Pronto decided to make reaching the contact page ridiculously easy. They added a contact-page-directed CTA in the home page hero shot and also created a sticky navigation bar with a Contact Us button, allowing users to click-through and convert to a lead at any point during their visit. Notice that their new design puts an orange “Contact Us” button at the very top of the page. It also offers a much more benefits-oriented presentation. There’s a much stronger focus on the industries served and results gained when working with Pronto. All these changes resulted from the insight gained through Crazy Egg heatmaps. Best of all, the new placement increased clickthroughs to their contact page by 17%, resulting in a 24% increase in site-generated leads! What could you do with 24% more leads? Fortunately, you don’t have to guess. You can try Crazy Egg’s Heatmap software completely free for 30 days. Do you have a Crazy Egg heatmap case study you’d like to share with us? Let us know! The post How Pronto Used Heatmaps To Increase Leads By 24% appeared first on The Daily Egg.